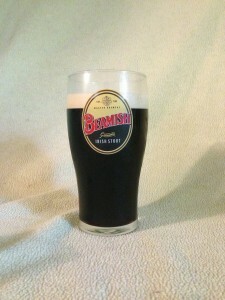 Beamish Stout is the third of the classic Irish dry stouts. Both Wyeast and White Labs package “Irish” yeast strains — Wyeast Irish Ale Yeast (1084) and White Labs Irish Ale Yeast (WLP004) — and either of these will work well. Most British ale yeast strains will also produce a fine stout. With the low starting gravity, a dry stout fermentation is not very stressful to the beer yeast. Be sure to aerate the wort well and pitch an adequate amount of yeast — a well-aerated 1 qt. (1 L) yeast starter will yield the right amount of yeast for 5 gallons (19 L) of wort around SG 1.040. Ferment the beer in the middle to middle-high end of the yeast’s fermentation range. Primary fermentation should be finished within a few days. Let the beer sit on the yeast for a day or two (to mop up any residual diacetyl) at fermentation temperature, then rack the beer to bottles or keg. If you are bottle conditioning the beer, prime to yield about 2.0 volumes of CO2 — substantially less fizzy than most American lagers, but in the range if many traditional British ales. You want just enough carbonation to form a nice head and give a slightly carbonated mouthfeel, but not so much that the beer tastes too thin or prickly. If you fermented at 70 °F, use 3.5 to 4.0 oz. of corn sugar (glucose monohydrate) per 5 gallons of beer to hit the right level. If you are kegging your beer, you have the option of pushing the beer with a mixture of carbon dioxide (CO2) and nitrogen (N2). In order to do this, you need a separate tank and regulator, plus a stout faucet. This will give you the “nitrogen pour,” with the cascading foam, that many people think of when they think of dry stouts (and particularly Guinness). However, keep in mind that a dry stout can be perfectly wonderful when pushed with CO2. My opinion is that the more aggressive dry stouts do well when pushed with nitrogen — the creamy mouthfeel from the fine nitrogen bubbles moderates the roasty bitterness. But for dry stouts with a bit of chocolate malt in them, I think you need the familiar prickly presence of CO2 (although the overall level should not be too high). In fact, I used to like Murphy’s in bottles (carbonated by CO2) back when I was in graduate school. Now that they have switched over to cans with a nitrogen widget, I don’t like it as much. As a homebrewer, you can decide for yourself how to serve your stouts. If you can manage it, splitting one batch into two kegs and tasting them side by side — one pushed with CO2, the other with nitrogen and CO2 — can help you decide.